In the next few weeks, I'm working on getting a lot of projects from my old LiveJournal posted up here for people who didn't see them the first time around. 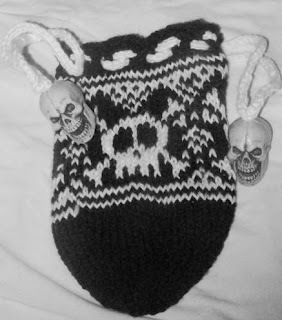 My first stranded knitting- A dice pouch made on homemade DPNs. No pattern, but the chart for the skull. "Actually, it wasn't as difficult as I thought it would be. I only used two colors, and some of my floats were pretty long, so I wrapped? twisted? whatever.. them every 3 stitches, and it turned out pretty okay. Even though my 2 yarns were a bit different weights. And it was acrylic yarn because I didn't see the point of using cotton with the gitd yarn which is acrylic." Why is the first picture greyscaled? Because I'm lazy. I accidentally hit the color correction on the camera and it came out *BLUE* so I adjusted it a bit and then greyscaled it. But you get the general idea right? The great big skulls are Halloween decorations, I picked up a "bag of skulls" then drilled them with my little hand drill and a largish bit. The chart as I did it. The chart as I'd do it again if I did it a second time. 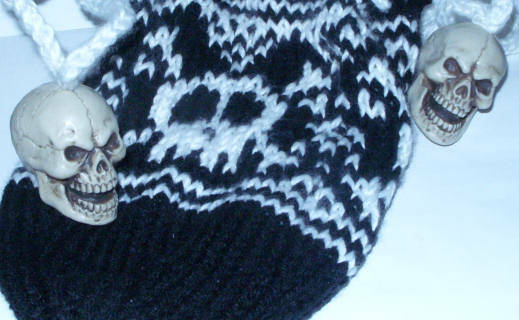 Now the hard question, which kid is gonna snag the glow in the dark skull pouch? Because one will. I know that." As it turned out, my son wound up with the pouch. He has a few dice pouches, not all of them filled with dice. I think his current dice pouch is a crocheted eyeball pouch that I made him.